When I was 22 years old, I was introduced to my lifelong love, running. The woman who introduced me to running was a coworker and friend by the name of Tomi (short for Thomasina). When we met, she was a 40-something single mom of four fabulous grown kids. One night, after one of our runs, Tomi told me her story. She had gotten married when she was a teenager, still in high school. Her husband turned out to be an abusive alcoholic and she found herself pregnant with her fifth child at age 20. She and her husband made the joint decision to seek an abortion. This was in the days before Roe v. Wade, and my friend and her husband didn’t have much money. The procedure took place in an office above a movie theater in downtown Detroit. In the following days, Tomi hemorrhaged and almost died. Fortunately, she survived. After her recovery, she found the courage to divorce her husband, return to school, start a career, and raise four terrific individuals who would each go on to give back to the world in their own meaningful way. While I’ve lost touch with Tomi in the ensuing years, I remember her fondly every time I go for a run. I’ve talked about the importance of providing your donors with a space to share their personal stories before. Sourcing narratives from those who’ve been positively affected by your wonderful work elevates your organization and sets your mission aglow with the kind of compelling truth that you probably won’t find anywhere else. Great donor stories can be invigorating and inspiring. National Abortion and Reproductive Rights Action League (NARAL) has worked tirelessly since 1969, through political action and advocacy, to secure women’s rights to abortion while expanding abortion access. 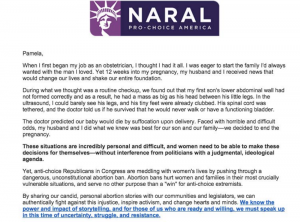 I recently received an email from NARAL, and it contained a personal story from one of their supporters, Dr. Cheryl Axelrod. She’s a practicing OBGYN who, twelve weeks into her own pregnancy, was faced with a difficult situation. NARAL gives her the floor so that she can tell her story in her own words. Her account evokes compassion and understanding, while not only motivating other women to share their stories, but providing them the opportunity to do so, via a “share your story” link. The Donate Now button is there, but it’s not the focus. In the followup *forwarded* email, the opening message from NARAL’s Digital Director sets the stage, while magnifying the urgency of supporting NARAL’s mission today and highlighting a tumultuous political backdrop that poses an ongoing threat. Good storytelling is at the very heart of nonprofit communications,. And collecting and recording those stories is a process that never ends. What’s a simple way that you can add to your organization’s storytelling bank? If your organization doesn’t already have a “Share Your Story” page, add one to your organization’s website, and invite your supporters to it by mentioning that this space exists in your donor communications. They’ll be drawn to it. Next post: What’s In My Mailbox | Are you forgetting that important last step?